As I shuffled the cards to select this week's Intuitive Tuesday tarot card, I said, "Tell me what messages I need to bring to my readers this week." I selected the Page of Coins from the Legacy of Divine Tarot by Ciro Marchetti. Pages typically indicate change or a new message coming your way or perhaps a young person. Coins (Pentacles) have to do with the material world, money, business, training and education. If it is a young person (either based on chronological age, mental and/or emotional development), it can be a studious, conscientious youth, one who is willing to learn, someone who is innocent and curious and possibly childish or child-like. In selecting this card today, use your intuition as you read the following descriptions to determine what the meaning is for you. If the Page of Coins indicates a change or message, you may have some news coming about your finances, your career or a new project. It is something that you will be excited about, even if a bit intimidated. When new things appear, there are people who initially say NO and others who say YES and welcome change. Which do you tend to be? The Page of Coins invites you to welcome new opportunities with an open mind. It doesn't mean you have to accept the offer or idea, but embrace the idea with optimism...at least initially. What are the possibilities here? FEEL your way through this instead of getting trapped in your thoughts. If you feel excitement, relish it. Sink into the sweetness of possibilities. You can apply logic later. If you open your heart to the idea and don't feel excitement, listen to the important messages that are there for you as well. Your emotions serve as guides to help keep you on your path...as long as you stop to listen and feel. If the Page of Coins symbolizes a person, the person that comes to mind may be a student or apprentice, someone who is open to and excited about learning. Pages tend to be young (in age and/or attitude) and the Coin aspects indicate someone who is practical, methodical and dutiful. As you read the descriptions above, which one feels right for you today? Your own intuition is your best guide. This card has both meanings for me. This evening I complete my Yoga Teacher Training by doing my SOLO 75-minute class for my fellow students to demonstrate what I have learned. Because I am SO new to teaching, I AM the Page of Coins. Over the past three months, I have spent a lot of time reading, studying, creating sequences and practicing teaching yoga classes. I'm excited to pass this last "test" and begin to teach students!! In addition, this past week my three teenage sons went back to school. My oldest, James, is a freshman, which means he is in HIGH SCHOOL. The other night I knocked on his bedroom door and found him studying! I didn't even have to remind him. He just did it! My Page of Coins is growing up! What messages does the Page of Coins have for you today? 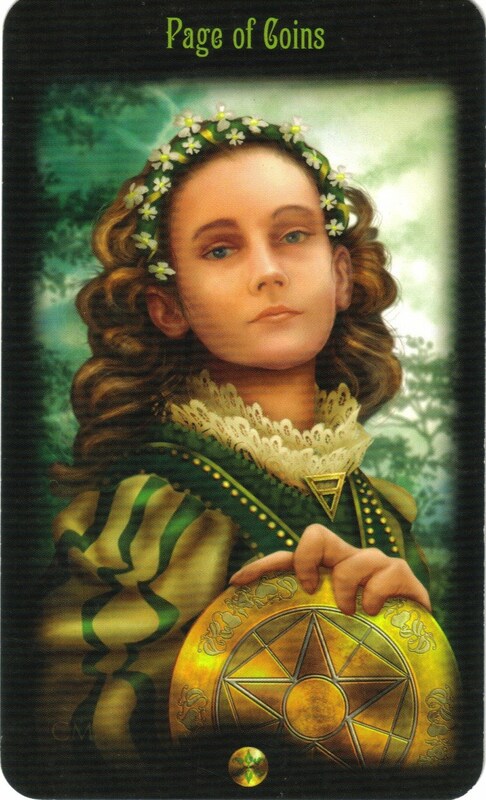 Approach your day with an open heart and mind as you welcome the Page of Coins energy into your life. Great message Sheri! Congratulations on completing your yoga training!! Just before reading todays post, I received an email (message) from a colleague requesting a CHANGE to a training schedule we are both involved in. I noticed my first reaction was to be annoyed, because of timing and a few other details - but when I noticed how that felt, I decided to breathe in and ask myself "what is the big deal really?" The answer - it wasn't a big deal at all. Then before replying to the email I thought "I'll see what Intuitive Tuesday has to say"... I love the magic of this great mystery called life! Very timely ~ as I've have "Aug 31" posted as a focal date on my calendar for the past two months for new energy in my work life. Woohoo, James! And congrats to you for seeing through your yoga teacher training! Can hardly wait to be on the receiving end of that. Interesting.........Went on a job interview today and I am very excited about the prospect of receiving an offer. It's actually in a field I've worked in before (advertising); however, this company has an intensive training program and because of the way marketing has changed due to the internet, lots of products I know very little about. The "funny" part is that I was wondering why I was so excited about the idea of selling advertising again. The message for me is...just enjoy. I like having permission to FEEL. I'm being tested by a childlike situation. People keep telling me it's not about me, to walk away and ignore the situation. But I FEEL over the situation. I'm not stuck in it and I'm not thinking through answers or solutions. I just feel. Sadness, regret, remorse, confusion, betrayal. When feelings like these aren't validated, the universe will find a way to bring them back.